Throughout the making of the eight Harry Potter movies, designers and craftspeople were tasked with creating fabulous chocolate-fantasy feasts, flying brooms, enchanted maps, and much more, in addition to numerous magical items necessary in a wizardâ€™s everyday lifeâ€”for example, newspapers with moving photos, vicious textbooks, and Howlers. Harry Potter: The Artifact Vault chronicles the work of the graphics department in creating vibrant and imaginative labels for potions bottles, brooms, and candy; the creation of Quidditch Quaffles, Bludgers, and Golden Snitches, lovingly crafted by the prop making team; and the stunning inventiveness used by the entire crew to create a rich, bewitched filmic universe. Accompanying the captivating text are never-before-seen art and design concepts, unit photography, and other filmmaking secrets from the Warner Bros. archive. 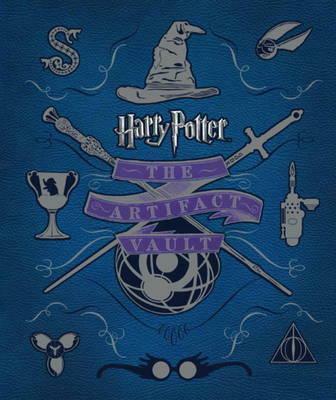 This striking full-color compendium includes two exclusive bonus insertsâ€”Gilderoy Lockhartâ€™s classroom questionnaire and a Weasleysâ€™ Wizard Wheezes catalogâ€”as well as many more surprises.